It’s a good thing that I have kids and grandbabes at home that I want to desperately see. And friends. And Abby and the donkeys. And the farm. It’s the only thing that gets me out the door when it’s time to close this place up for the season. It especially does that though, with the smiles and laughter and embraces of the folks that I will miss so much over the next nine months. It’s hard to turn the lights off and leave one more house darkened over the long winter months. 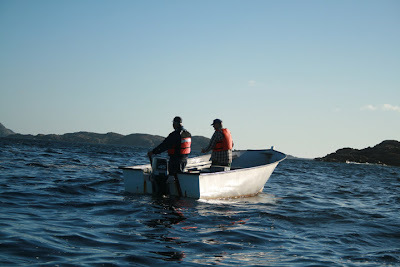 This morning, I made one last trip out to sea with Heber. He fished; I observed. I watched those experienced eyes intently scope out the landmarks. I watched with great fondness as he dropped his line in - remembering countless times over the past seven years when he’s done the same thing with the boat filled with my family or friends. Today it was just the two of us. I quietly savoured every moment and soaked the time deeply into my being. He fished. I observed. I watched the clouds – gentle smudges on the pale blue sky, suddenly as the wind change, turn into it into a deep, gray palette that totally changed everything about the day. One moment is was July – warm, pleasant t-shirt weather; then literally seconds later, it was late autumn – jacket, hat, blanket and a darkened November feel. Both were stunningly beautiful. He fished. I laid back and felt the roll of the sea. The waves advanced and receded, advanced and receded – similar to the emotion I was experiencing. I scanned the horizon for whales, that were out there somewhere, and dolphins, which had been spotted the day before on the big causeway. Two of our neighbours drove up to compare results with Heber, then picked their spot a few hundred feet away. Later he told me that they had a number of sharks encircling their boat … ‘little ones’ – just three or four feet. I would have like to see that – I had my camera this time. After missing the sea of hundreds of dolphins, I was not about to leave home without it ever again. I took snapshots in my head too: the entire image that is far beyond a four by six; and the feel – inside and outside. When I got back, I made my usual rounds of goodbyes, which takes me throughout the neighbourhood and up to the hospital. Two of my sweet friends are both 93 years old. One fella’s response to my cheerful ‘See you in the spring!’ was a matter of fact: ‘Don’t be too sure of that. You likely won't see me.’ The other, just as matter of fact, said ‘I just might hop in the car and drive up there to Ontario to see you - don't be too surprised to see me.’ They both made me smile. I thought about some goodbyes last year, which indeed were the final fall farewells for some dear and precious friends. And again the tide of emotion washed over me and the sea rose up to my eyes. I allowed myself those moments of bittersweet memory. Sweet, in that they had so unexpectedly come into my life, and bitter in that it was much too short. And then I switched gears, got busy covering things ups and taking a mental inventory of what I need to/want to do next year. That and the thoughts of the other half of my world awaiting two thousand miles away, sent the tides rising once again. This time, Joy and Gratitude for having such a doubly blessed, rich life filled with the most amazing people and places. What a gorgeous post, Evie! I can see why it's so hard to leave. But if memory serves, you've got another beautiful place to go home to. You have gathered wonderful warm memories for our cold Ontario winter nights. Before you know it, you'll be planning your next trip to the Rock!! yes, the time flies by in both places ... and I DO need to get back to creating!